The following description is lifted directly from [Blight 1885] but note that the text was prepared for the Gentleman’s Magazine 1862-64 and is largely unaltered. It must be read in the context of that date. The drawings are by the author. From the Rood Screen, St. Buryan. THE DEANERY OF ST. BURIAN. “On the 4th of November (1328), being at St. Michael’s Mount, he (Bishop Grandisson) excommunicated with all form the principal delinquents, especially Richard Vivian, the most obnoxious of all. At his public visitation, on July 12, 1336, the bishop found the parishioners returned to a sense of duty, and truly repentant for their contumacy and at their earnest supplication he absolved them from their censures, and preached to them from the text, 1 Peter ii. 25, ‘Ye were as sheep going astray, but are now returned unto the shepherd and bishop of your souls.’ To add to the Bishop’s satisfaction, the dean, John de Maunte, on Aug. 16, 1336, waited upon him at Bishop’s Court, Clyst, promised amendment in future, and took the oath of obedience to him and his successors in the see of Exeter. The “church-town” of St. Burian stands on a high position, and the lofty tower is a very conspicuous object from the surrounding district. The spot commands extensive views, terminated on the south and west by the distant horizon of the Atlantic. Dr. Oliver gives in his Monasticon the act of the dedication of St. Burian’s Church on the 26th of August, 1238, by Bishop Brewer of Exeter. 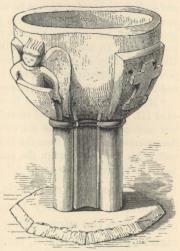 But few relics even of the church of that period remain: the font may have stood there at that time, it is of Ludgvan granite c, and has on the bowl three angels (not four as Dr. Oliver says) supporting shields; on a fourth shield is carved a plain Latin cross on two steps. On the opposite side there is a small Maltese cross between two of the angels. The height of the font is 2 ft. 11 in. It has been cleaned of the lime-wash which at one time covered it. Arcades of Roodscreen, St. Buryan. 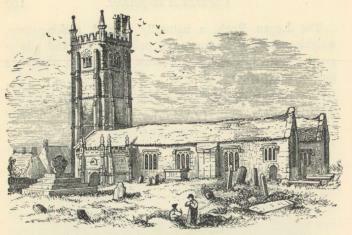 In the early part of the present century this church was particularly rich in carved oak benches, and possessed a magnificent roodscreen and loft. In the year 1814 the building underwent repairs, when the benches and screen were barbarously destroyed. The plea for taking down the latter was, that it deadened the preacher’s voice; a portion yet remains. About two-thirds of the curiously carved cornice has been placed in its original position, extending across south aisle and nave, and some of the beautiful arcade-work is preserved in a large chest within the church. The workmanship, as the accompanying cuts will shew, was exceedingly rich; the whole was gilded and painted, chiefly in red and blue, and each compartment was of a different design in the tracery. The screen extended the whole breadth of the church, and must have had a very fine effect. It was put together with wooden pins, no nails being used. The vandals who took it down do not appear to have had the least regard for it, for if they had no reverence for the holy things of the sanctuary, it would be thought that they would have taken some care to preserve the several portions merely for the sake of the beauty of the designs. Such, however, was not the case, for their saws were ruthlessly passed through the most elaborate tracery. It is said that some figures of saints belonging to this work were to be seen as chimney ornaments in the houses of the parishioners, and some of the bench-ends and panels were used as ordinary wood about farm out-houses. 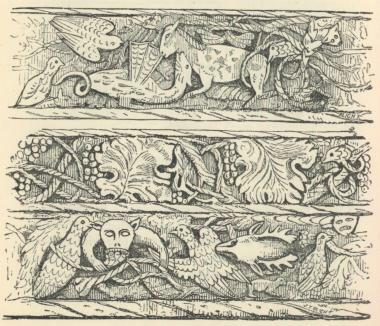 On the upper part of the cornice is carved a vine pattern, beneath which are very curious scenes of hunting, warfare between animals and birds, and grinning heads: the workmanship is somewhat rude, but the effect is good. Some of the lower panels remain in situ, but no part of the connecting frame-work is to be found. The outer part of the screen was gilded and painted with different colours, red and blue predominating, but the inside, facing the altar, was entirely red. The spiral staircase, in the wall of the south aisle, which led to the rood-loft, has not been destroyed. Adjoining the screen, within the chancel, are four oak miserere stalls, placed two on either side of the entrance from the nave to the chancel. Dr. Oliver says they were “destined for the dean, for the prebendary of Respernell, for the prebendary of Trithing, and for the holder of the ‘Prebenda Parva.’ Fortunately they have escaped destruction from the hands of the Puritans, and the no less mischievous pew-builders of more recent date.” It has been suggested that when there was a choir at St. Burian‘s one of the stalls might have been for the precentor. Each stall has a moveable seat; when turned up, a rounded ledge is brought forward which served as a sort of occasional rest for the monks. 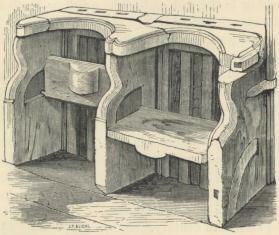 The engraving shews one seat raised and the other down. The chancel end of the church appears to have undergone alteration in modern times. 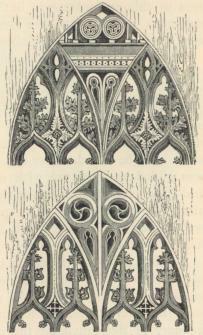 The large east window, which has a pointed arch, does not retain its original tracery. A smaller square-headed window on the south side has been recently re-opened. On the north side there was an unusual arrangement, which can now only be seen from the outside. Here we find that a large archway has been built up, and in connection with it immediately under the window of the north aisle there were three stone steps, evidently constructed with the original wall. These steps were to be seen about twenty or thirty years ago, and though now removed, their position may be traced. 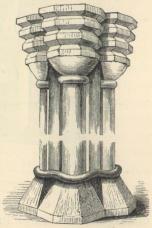 There are no remains of a piscina either in the chancel or in the east end of the north or south aisle, for the church probably had three altars. The aisles are connected with the nave by six pointed arches. The piers have a simple ogee moulding; the capitals, though of a plain character, have a bold effect. The aisles are each lighted by five square-headed windows, with hood-mouldings, divided into three lights, which are rounded at the top, and were inserted late in the sixteenth century. The tower-arch is lofty, and its mouldings are bold and effective. Over the tower doorway, on the outside, is a shield bearing the sacred monogram I.H.S. The Perpendicular window above this is much superior to those at the east end of the church, and evidently of earlier date. 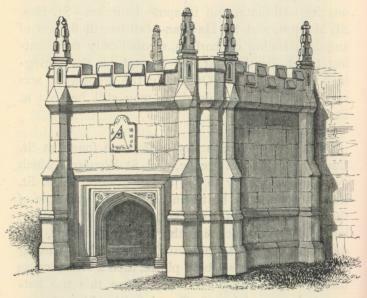 Within the tower, on the pavement, is an ancient tomb which, when Whitaker visited the church about sixty years ago, was “lying near the altar-rails, but on the floor in the northern access to it.” According to Hals it was discovered about the year 1665, buried four feet in the ground, by the sexton while digging a grave. The inscription, he says, “was difficult to be read,” but the “curious” found it to be “Jane, the wife of Geffery de Bolait, lies here: whosoever shall pray for her soul shall have five days pardon, M.L.X.IX.” Another writer says, that “not only the year, but even the month and day of the month are both inserted,” and he supposed it to mean “March 16, 1101.” He then gives an incorrect reading of the inscription. At present there is no appearance of any date on the stone. The county histories vary in the wording of this inscription, owing probably to their authors inaccurately copying what had been previously published, and not taking the trouble to examine the monument for themselves. As will be seen from the engraving on the next page [here], the inscription, which is in Norman-French, is cut in letters of the thirteenth century, and runs as follows:—+ Clarice : la : femme : cheffrei : de : bolleit : git : ici : dev : de : lalme : eit : merce : ke : pvr : lealme : pvnt (priunt) : di : ior : de: pardvn : avervnd—”+ Clarice the wife of Geoffry de Bolleit lies here, God of her soul have mercy: who pray for her soul shall have ten days pardon.” The stone is seven feet long, and has a floriated cross on three steps carved in relief on the upper part. The family of Bolleit resided on an estate of the same name in this parish. The tower, which is constructed entirely of wrought granite, is divided into four stages, and has double buttresses at each angle. The newel staircase is contained in an octagonal turret which rises picturesquely above the parapets at the south-east corner. The bells are three in number. The largest has this legend, “Virginis egregiæ vocor campana Mariæ,” i.e. “I am called the Bell of the glorious Virgin Mary;“ and the date 1738. It is singular to find such a legend on a post-Reformation bell; probably, however, it was in that year recast and the original legend reproduced. The bell has a flaw or crack running through it, for which the following tradition accounts. The bell was cast in the village of St. Burian, and before it had hardened, a man jumped from a hedge near the mould, which being disturbed by the shake, rendered the bell imperfect. Its diameter is 3 ft. 9 in., an unusually large size for Cornish bells. The next bell has for its legend, “Vocem ego do vobis: vos date verba Deo,” i.e. “I give to you a voice; give ye words to God.” Date 1638, diameter 3 ft. 6 in. The third bell has the names of the Churchwardens,—” Mr. Richard Davies, Sampson Hutchens—wardens, 1681.” Diameter 3 ft.
Near the porch, on the right hand side of the path, is an ancient cross on a flight of five steps. Another cross stands without the churchyard, and there is a tradition that the churchyard at one time surrounded it. This, however, is not probable. About a mile south-east of St. Burian, on the estate of Bosliven, are some remains of an ancient building, to this day called “the sanctuary.” It has been considered as the original “sanctuary” of Athelstan, but the title and privileges of sanctuary pertained to the church, the churchyard, and sometimes a limited space beyond. C. S. Gilbert says of these ruins that they appear to be the remains of the chapel attached to the Deanery-house. Dr. Oliver mentions a “capella Sancti Silvani” as having existed in this parish. The building at Bosliven appears to have been much larger than the other ancient chapels of which remains are found throughout Cornwall. But whatever it may have been, sanctuary, chapel, or oratory, it seems to have incited the rage of the Puritans; for it was almost totally destroyed by Shrubsall, one of Cromwell’s miserable instruments of sacrilege. This fact alone is sufficient proof that at that time it was a sacred edifice of some note. The adjacent parishes of St. Levan and St. Sennen form part of the deanery of St. Burian. (c) The granite from Ludgvan parish is a better material for fine sculptured work than other granite found in the district.